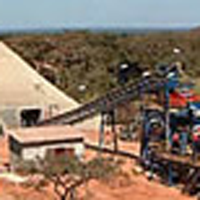 Phase 1 constituted the construction of the concentrator to treat oxide stockpiles, with a life span of approximately four years. The flotation plant was constructed to treat stockpiles during this phase. Phase 2 saw the mining of the Ruashi opencast orebody. This phase involved the construction of an expanded concentrator, the acid leaching section, along with a solvent extraction plant for the production of copper and cobalt metal on site. The completion of the construction of the Sulphuric Acid/Sulphur Dioxide Combination Plant was imperative due to the increased usage of acid and SMBS resulting from the high production costs of copper and cobalt at the Ruashi Mine. The benefits of this, resulted in improved cobalt quality, along with increased copper quality and the current efficiency. The heat generated throughout this process is used to wash the tanks to improve the washing efficiency for optimal sulphate removal and improvements to the cobalt precipitation performance. Through all of this, the mine places a huge emphasis on safety. The drying of the cobalt hydroxide to reduce the cost of transport, involves the installation of three agitated spin flash driers. This, in essence, reduces the mines reliance on electricity and the mine benefits from the lower operating costs. Ruashi Mining currently produces 38 000 tones of Copper and 4 400 tons of Cobalt per annum.